There's something just infinitely joyous about this film. I sat through almost the entire film with a big grin on my face. And when I wasn't grinning I was on the verge of tears with either laughter or genuine emotion. Everybody knows this story, about Frank Abignale and his teenaged con-artistry. But it's directed with such a pep and spring and light touch that it just floats and bobs and weaves effortlessly around. It's a wonderful thing to be able to see a film by a director and actors who are all doing everything exactly right. 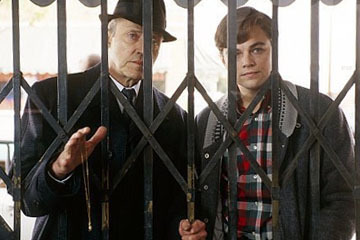 Leonardo DiCaprio has a surprisingly tough role as the young Frank, but he disappears completely into it. This is not the same Leo from Titanic or Romeo and Juliet. This isn't Leo at all; within just a few seconds he IS Frank, sinkig completely into the man's (or boy's) skin. Christopher Walken is wonderful as the tax-evading yet never-yielding father. He's just so kooky and fun, and he gets to dance on-camera again, which is nice, as anyone who saw him in the Fatboy Slim video knows well. Tom Hanks is also virtually invisible under a very restrained performance and very thick accent. You watch this film aghast at everythign that Frank gets away with just by acting like he knows what he's talking about. And even when he confesses the truth people won't believe him! Right from the start when the substitute teacher at his new school is late and Frank gets this look in his eye and walks up to the chalkboard to write his name, I just started giggling. And the only times I wasn't giggling was when I was feeling terribly sympathetic to this kid who ran away from home when he was 17, whose parents get a messy divorce, whose father gets the shaft from the IRS, and who has to keep on looking over his shoulder for Tom Hanks. Man, this film is great. It just flies by, even though it's well over two hours. It's got a light, snappy beat, and you can swing to it (this is one of John Williams's best Spielburg scores in about a decade). It's an absolute hoot and I loved it.